The Bible likens Christianity to a race in which believers are running toward the finish line. Christians are often left to run this race by themselves with little assistance to reach the end. Many drop out of the race, injure themselves, or even run the wrong way. It is exciting to run the Christian race. But just like in a literal race, there are many things to learn and much training is required. 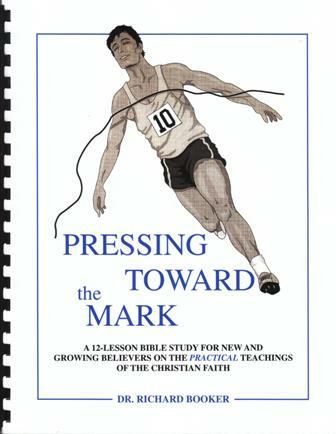 Pressing Toward the Mark is a unique teaching manual designed to help new and growing believers run the race of faith. The author has divided the manual into twelve lessons in which he explains the practical teachings of the Christian faith. The manual is organized in away that will help you to learn these practical teachings in a simple, quick, systematic manner. Pressing Toward the Mark follows the same format as the Fast Start in Christian Living manual. 1. Easy-to-Understand - The information is presented in a question and answer format. The manual is divided into twelve lessons with five important questions for each lesson making a total of sixty questions. 2. Speed-Learning - Each question is answered twice on one page. The first answer is in a short statement found in a gray-screened box which immediately follows the question. A more detailed answer follows and is limited to the one page which you can read in a few minutes. This is a unique speed-learning technique. 3. Personal Study Guides - A Personal Study Guide is included at the end of each lesson. You can complete them by writing your responses in the spaces provided.